I'm an observational astronomer with an interest in planet formation. I use interferometric imaging techniques to push the capabilities of adaptive optics corrected telescopes. 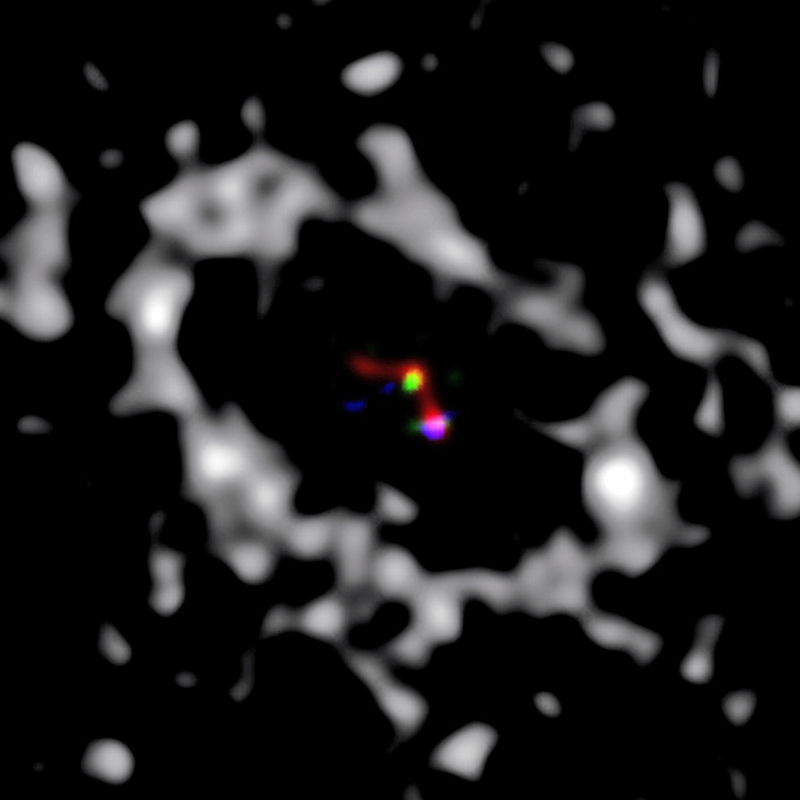 I've mostly been using non-redundant masking to search for and characterize companions in transition disks (protoplanetary disks with inner clearings that might be shaped by forming planets). Simulated JWST NIRISS NRM (a) and NIRCam filled-aperture (b) PSFs. The lower two panels show the NIRISS (c) and NIRCam (d) power spectra, with Fourier phase sampling locations over-plotted. I used real data and simulations to compare the techniques of non-redundant masking (NRM) and filled-aperture kernel phase for exoplanet detection. While NRM uses a mask to turn a conventional telescope into a non-redundant interferometer with several sub-apertures, kernel phase involves treating a conventional telescope as if it were made up of many sub-apertures with redundant baselines. We found that under certain conditions, kernel phase can outperform NRM. Both techniques will produce exciting results on the next generation of telescopes and AO systems. Check out the article on arXiv and soon in JATIS. NRM data taken with the 23-meter LBTI reveal a disk with skew and a compact infrared excess. Check out the article on arXiv or in The Astrophysical Journal. Calibrated data in oifits format can be found here. From Sallum et al. 2015b. 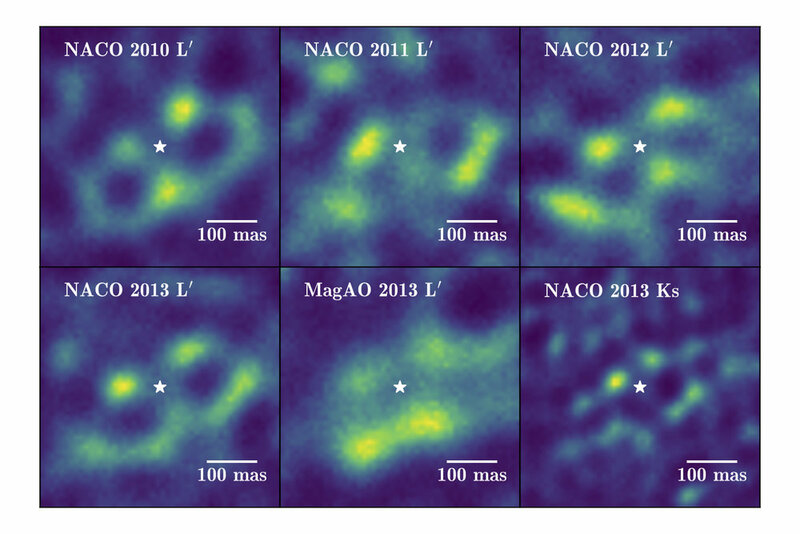 Composite image of new LBT (red, green), and MagAO (blue) observations of LkCa 15. The greyscale shows millimeter observations of the outer disk from Isella et al. 2014. Large Binocular Telescope and Magellan Adaptive Optics System observations of the LkCa 15 revealed the first unambiguous direct images of planet formation! The position evolution of three infrared sources in the disk clearing allow for distinct circular orbits aligned with the outer disk. We also detect H-alpha emission coming from one of the sources, tracing accretion directly! The infrared fluxes, apparent orbital motion, and H-alpha emission are best explained by three planets with circumplanetary accretion disks. Check out the paper on the arXiv, in Nature, or in the news. The T Cha transition disk had a protoplanet candidate detected in a single epoch observation. Here I took a look at several epochs of Very Large Telescope and Magellan Adaptive Optics System observations of T Cha. The images and best companion model fits can't be explained by a planet orbiting in the plane of the outer disk. Check out the paper on the arXiv or in The Astrophysical Journal. From Sallum et al. 2015a. χ2 slices at the fixed contrast ratio with filled contours at 1 to >4σ confidence limits. The line indicates a circular orbit in the plane of the outer disk. The × symbols show the initial position of the putative companion from our re-reduction of the 2010 VLT L band data, while the circles show the predicted position(s) of a planet on the orbit. We plot two since the planet could be orbiting in either direction. From Sallum et al. 2016. Simulated masking observations of T Cha's outer disk. If you fit single companion models to data like this you might see best fit companions with erratically changing position angles. Check out the paper for more details. Transition disks are dusty! And masking observations aren't always the best at telling the difference between signals caused by scattered light from disk material and protoplanet companions. Here I compare the multi-epoch datasets we have for T Cha and LkCa 15. I simulate NRM observations of T Cha's outer disk and LkCa 15's inner and outer disks. I show that the companion signal in T Cha is best explained by forward scattering from the outer disk. However, the two LkCa 15 disks can't cause companion signals with positions that change smoothly over time. Check out the paper on the arXiv or on SPIE.